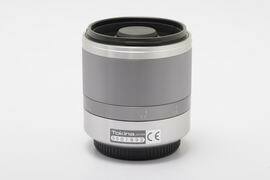 The latest Tokina Reflex 300mm /F6.3 MF Macro is now available in 9days. Built specially for Micro Four Thirds system, the super-light lens effectively shoots at 600mm which is an ideal range for telephoto. Customers can purchase from our shop or shop online. Price is HKD 3,600. Weighted only 298g, it adopts a reflex lens design thus making it a very compact choice. A minimum focus of 0.8m adds versatily to the new lens.